Is Matomo On-Premise right for you? There are two ways you can host Matomo Analytics. 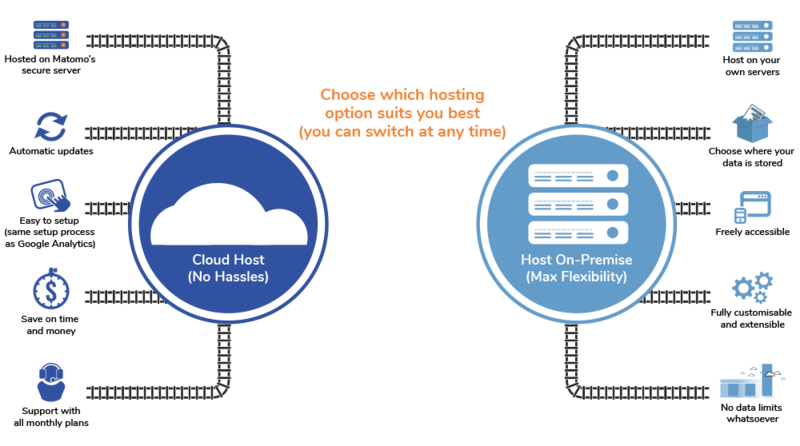 Either self-host it yourself with Matomo On-Premise, or host it through the Matomo Cloud. You can breathe easy knowing both options give you full data ownership and respect for user privacy. However, the process doesn’t end with the click of a button as Matomo On-Premise does require technical knowledge about hosting applications on your own servers. For businesses this is often taken care of by an IT department. If convenience and technical expertise is a factor, why not choose Matomo Cloud? With the cloud hosted option we can smoothly take over the setup, monitoring and maintenance for you. Though we try to meet the needs for all data set sizes for our Cloud users, with On-Premise the sky is the limit! If you want to setup and manage Matomo like your other favourite analytics tool, then the Cloud may be the best option for you. When you Cloud host Matomo you will save time on setup, maintenance and monitoring. Support subscriptions are an additional paid option for On-Premise users though free community support through the forums is available. On-Premise reliablity and security relies entirely on you and the security you have in place for your servers. Through the Matomo Cloud we take care of all this and ensure there are backups, monitoring etc. Wondering what to do next after you’ve downloaded Matomo On-Premise? Want to get started with Matomo On-Premise? With the know-how, getting started with Matomo On-Premise may not be as complicated as it may seem. There are many ways to get you up and running as quickly as possible. Before you know it, you’ll own your data, have no data restrictions and be on your way to gaining the insights you need to make better data-driven decisions.